Malta is an island nation in the Mediterranean Sea located 80 kilometers south of Sicily, east of Tunisia, and north of Algiers. It became an independent country in 1964 from the United Kingdom and joined the European Union in 2004. Located where it is near the cradle of civilization, it was owned by many different countries including Greece, the Normans, Aragon, Sicily, and France. The population is over 400,000; that, combined with its relatively small area, makes it one of the most densely populated countries in Europe. The capital of Malta is Valletta. The historical part of that city is quite small (6,400 population), but almost 400,000 live in the larger metro. There are three major islands in the archipelago. 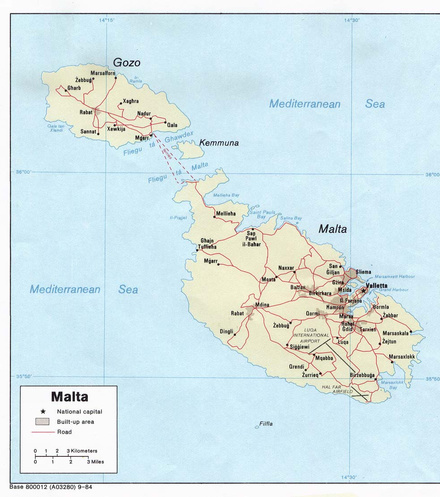 Maltese is the national language and English is the official language (spoken by 88% of the population). Tourism is a very big industry in Malta - it hosts three times as many visitors each year than it has residents. They come for its warm climate, numerous recreational areas, and architectural and historical monuments, including three UNESCO World Heritage Sites. There are seven megalithic temples, some of the oldest free-standing structures in the world. Banking and finance are growing in importance. Limestone is one of its few natural resources. Water is in short supply in the summer dry season and solar has the potential to be an important power source. Shipping is important and there is some electronic manufacturing. The Grand Harbour (or Port il-Kbir), located at the eastern side of the capital city of Valletta, has been a harbour since Roman times. It has several extensive docks and wharves, as well as a cruise liner terminal. A terminal at the Grand Harbour serves ferries that connect Malta to Pozzallo & Catania in Sicily. The Malta International Airport serves the country. The country is a popular location for international retirees, particularly those from the European Union, which can move here freely. Most of the foreign community in Malta, predominantly active or retired British nationals and their dependents, is centered on Sliema and surrounding modern suburbs. Other smaller foreign groups include Italians, French, and Lebanese. In January 2014 Malta started granting citizenship for a €650,000 contribution plus investments, contingent on residence and criminal background requirements. Healthcare Malta has a long history of providing publicly funded health care. The island nation has a strong general practitioner-delivered primary care base and the public hospitals provide secondary and tertiary care. Medical based tourism seems to be starting here.